The eighteen-wheeled leviathan piloted by Furiosa is the most iconic vehicle riding the Fury Road. 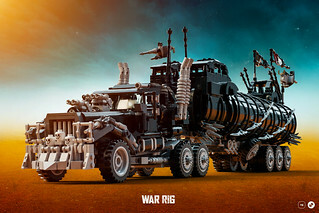 This model features different details from the movie like the “bone” gear shift or the skull hiding a gun on the tanker. INSTRUCTIONS HERE and full review by Brickvault!